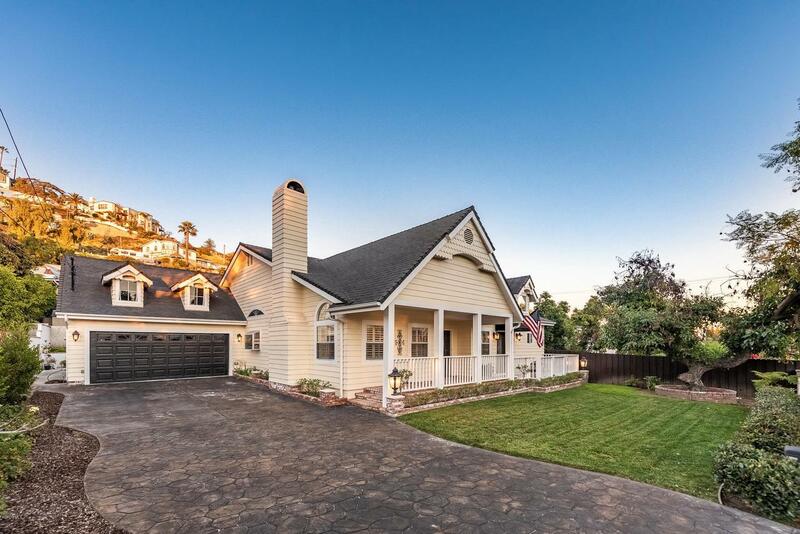 Sensational single story, custom Cape Cod with 3-bedroom, 2.5 bath, has all the charm and character of a home right out of the pages of House Beautiful! Natural light abounds in this open floor plan with high ceilings, skylights, beautiful wide plank wood floors, crown moldings, plantation shutters and private automatic gate. Raised hearth fireplace in living room which has vaulted ceilings and recessed lighting. The gourmet kitchen is central to the home with built-in stainless steel appliances, garden window, large pantry and breakfast counter. The family room has French doors to the rear yard where there is a covered patio with brick accents and small unfinished casita which could be converted to an artist studio, music or prayer room. One master suite at the rear of the house and second master suite at the front of the house with en-suite bath, walk-in closet and French doors to front brick patio. Third bedroom is being used as an office with a custom built-in work center and shelving. This home has been immaculately maintained and boasts exsquisite architectural detail in an excellent location near Disney, NBC, Warner Bros, Nickelodeon, Burbank Airport with freeway access plus blue ribbon Burbank schools.